Photos taken by Tony Castley. The first round of the Electric Formula Xtreme Championship has been run and won by Newcastle’s Catavolt Electric Motorcycle Racing Team. The competition would prove to be a fierce wheel to wheel battle for the entire weekend. With good weather and plenty of track time, the team were able to work on some of the bikes set-up issues now that the power output was great enough to warrant changes. With this in mind they started to focus on suspension adjustments and tyre size and grip. Thanks to help from Craig White of White’s Racing Products, the decision was made to change tyres for the weekend’s races. The team mounted Sava brand tyres that gave a better matched profile to enable better cornering and more all-important adhesion. With track temperature cool, the electric bikes headed out on track for the first session of the day. This season Team Catavolt have mounted water cooling into its real wheel hub motor which has effectively allowed them to up the power output without fear of over heating or failure. These changes resulted in Catavolt rider Jason Morris setting a new qualifying lap record of 1.17.210 to take pole position for the two races. 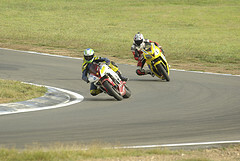 Race 1 – Jason took the lead from the start of the first 4 lap encounter, which saw the battle for the lead between the two riders swap several times. On the drag to the chequered flag the Catavolt bike was well clear of the Ripperton entry of Daniel Sailer, however Jason accidentally pulled his safety lanyard, cutting the power to the bike 10 metres short of the line and thus allowing Ripperton to take the win. 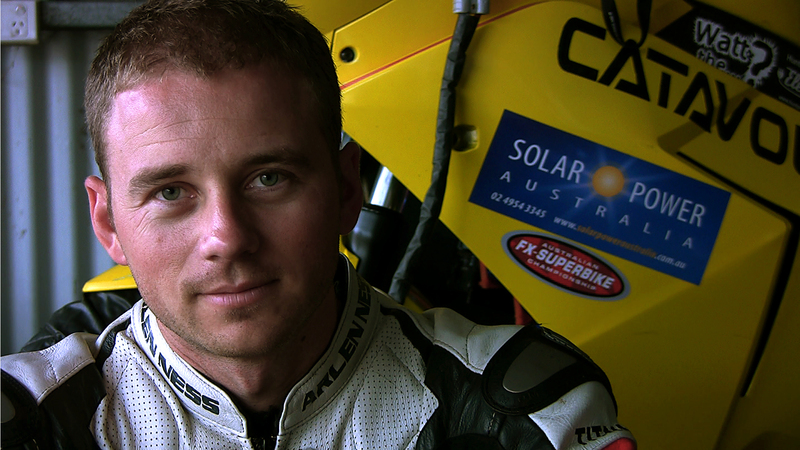 With Jason’s comical rider error in race one robbing the team of a win, he was determined to make amends for race two. 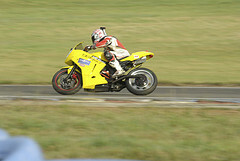 Starting out of pole position again, Jason shot to the lead from the start and lead the race from start to finish winning the race and the round and taking the lead in the 2012 EFXC championship. With the racing being so close for race 2, Jason was able to set a new personal best lap of 1.15.852, some 4 seconds better than the team’s best lap time for 2011. Since the teams first ever outing at Wakefield Park in 2011, Team Catavolt have shaved an amazing 15 seconds off their lap times, true testament to the development in technology for these revolutionary machines. Team Catavolt would like to thank its sponsors Solar Power Australia and Enertrac Hub Motors for making it all possible.